Crêpes day ?! What is it about ? Yes, we, the French are obsessed with food !! After January, the month of the « Galette des Rois » (King’s cake’s month), February is « crêpe time » ! 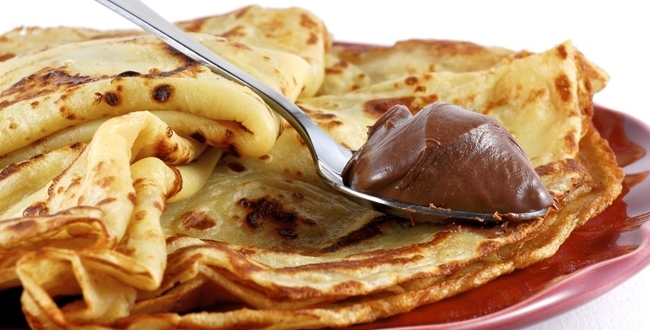 The 2nd of February is the “Chandeleur» (= « Candlemas »), the “official” crêpes day, 40 days after Christmas. Only one crêpe day ? What’s the difference between crêpes, galettes and pancakes ? None of them look like the same; the recipes are different and the 3 are not made of the same ingredients. 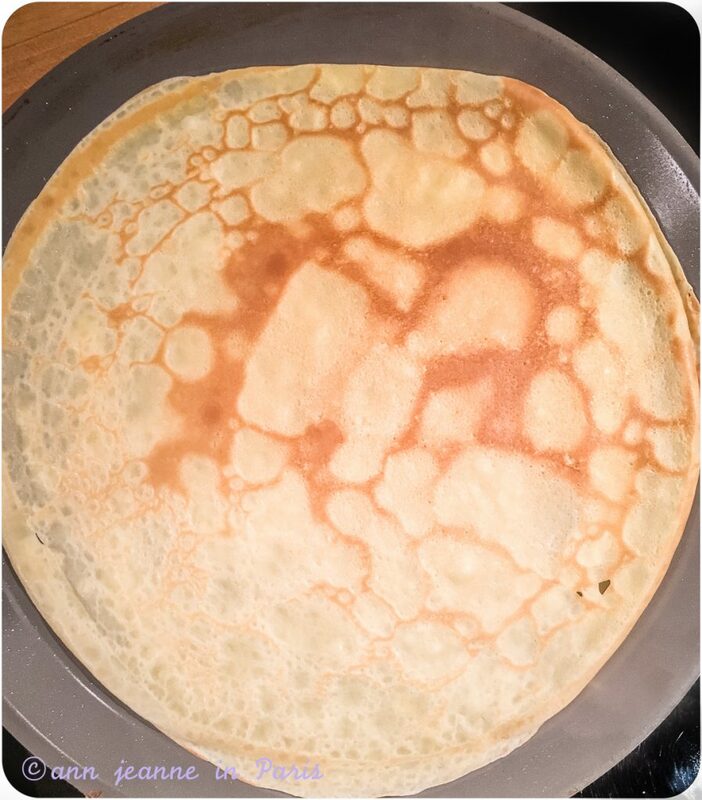 Crêpes are a lot thinner and flater than pancakes (about 22 cm diameter). They are traditionnaly sweet. Their ingredients : eggs, milk, salt, white flour (plus some alcohol – optional : Rum, Cointreau or Grand Marnier…and so on ). They do not contain baking power and they have a higher liquid to flour ratio. They are either rolled or folded with a filling. 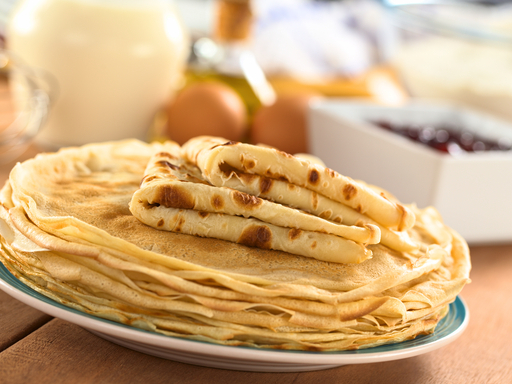 Galettes : Galettes originates from Brittany (northwest part of France) They are as thin and flat as crêpes. Their color is brown/grey and they are traditionally savory. They are made of buckwheat flour, water and salt… that’s all. Nothing more (The real galette contain no eggs, no milk)… If not, the galettes you’re eating are not real galettes…. !!! 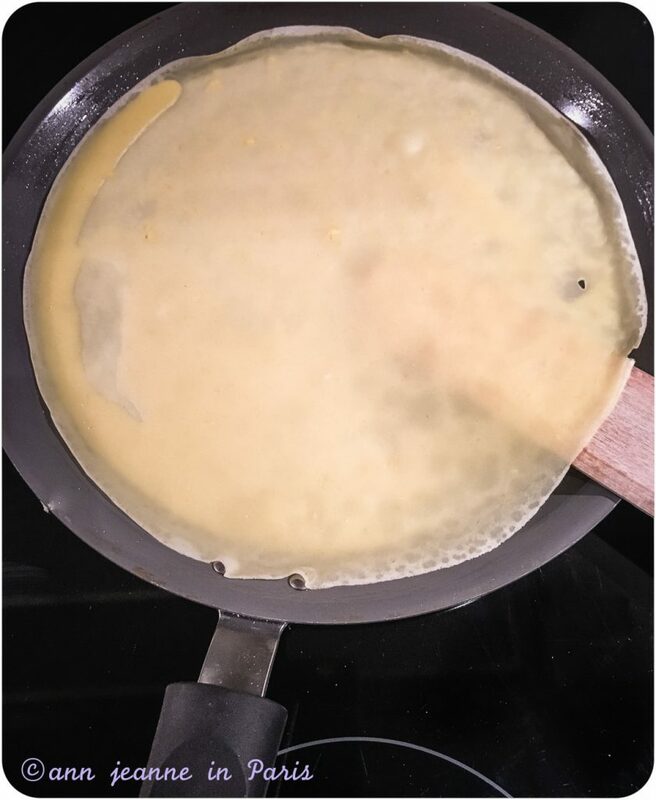 (However, some crêperies may add some eggs…) And they are much much more difficult to cook than sweet crêpes. That’s why we French people never (or rarely) cook them. Unless you’re very talented (! ), you need to be trained as a professional to cook proper galettes, (the ones that you can eat in Crêperies*). They are generally stuffed with cheese, eggs, spinach..etc. 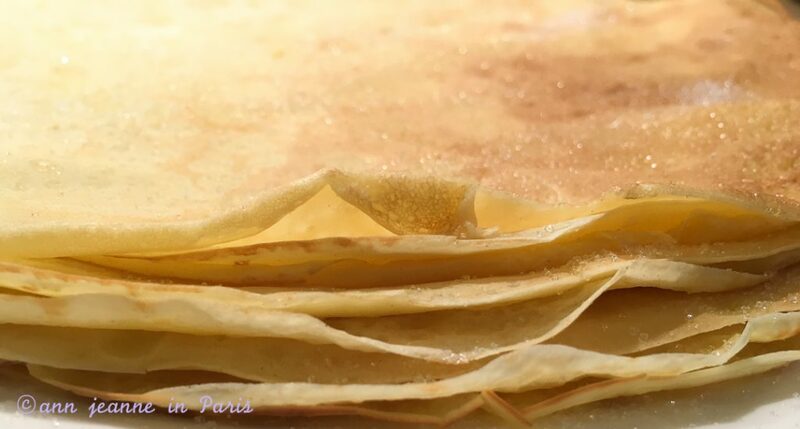 Fillings are added to the center of the crêpe and served with the edges folded over the center of the galette. However, you can buy them pre-cooked in delicatessen shops or supermarket such as “Monoprix” . * There are 5000 crêperies in France. So, wherever you are in France, you ‘ll probably easily find a crêperie, where you can get a whole crepe meal with savory crepes (galettes) then a dessert with sweet crepes. 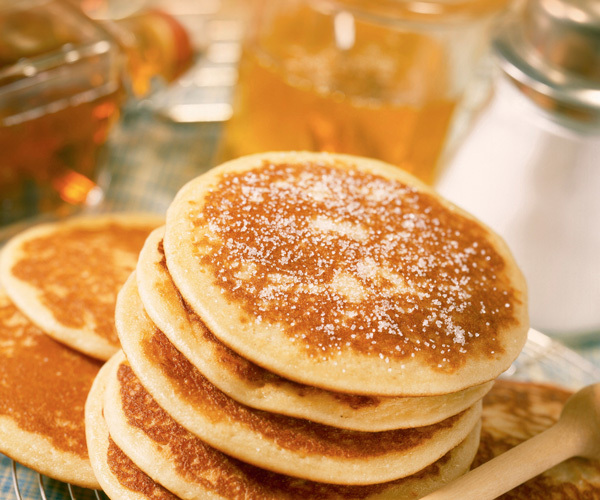 Pancakes are thicker and fluffy, and have got a raising agent in the batter. Their diameter is much smaller than crêpes or galettes. The ingredients are different : the crêpe’s batter doesn’t contain any raising agent. What about flipping the crêpes ? You’ve maybe heard of the tradition of flipping the crêpes while holding a gold coin in the other hand, This tradition says that if you catch the crepe with the frying pan, you will enjoy prosperity throughout the coming year. Actually, the tradition is not really followed anymore. And only a few persons bother to flip the crepe tossing it in the air !! Crêpes : savory, sweet or both ? Yes, the crêpes can be either savory or sweet, but first of all, they are meant to be sweet. For a savory meal, it is a galette (not a crêpe). 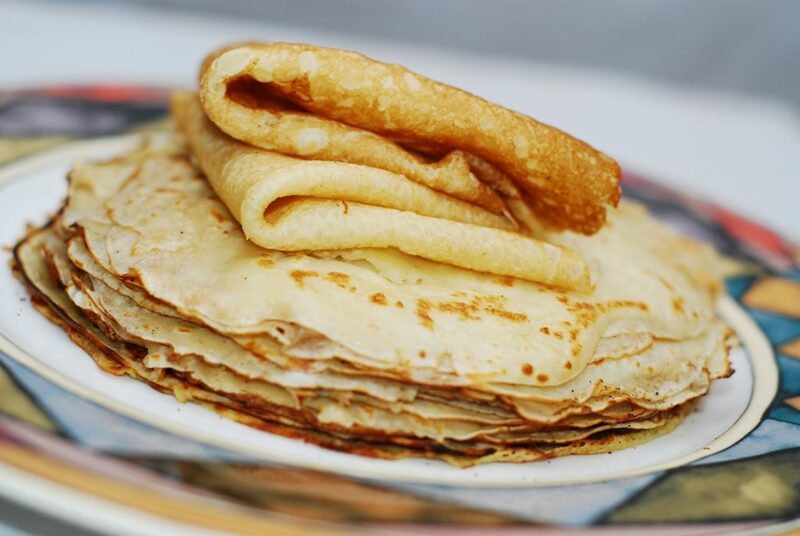 The crêpes are usually eaten for tea time or as a dessert at lunch time or dinner time or anytime of the day! In a bowl : put the flour and the salt. 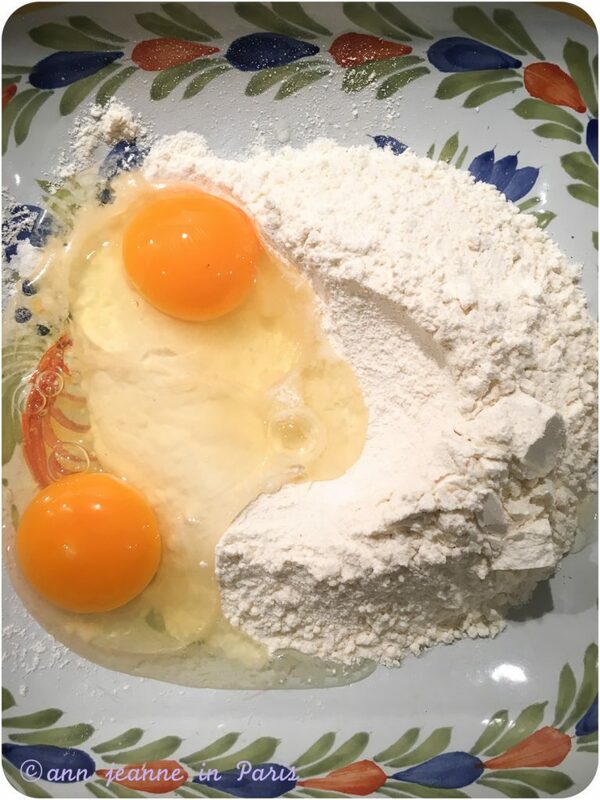 Break and add the eggs and mix with a wooden spoon until it become a homogeneous and smooth paste. Then insert gradually the milk, and a small amount of margarine or butter (about 10 gr and mix everything until smooth. The consistency of the batter should be like that of a thick syrup. Let the batter rest for 30 minutes. It’s better to let it rest but it’s optional (I don’t often do it, nor many persons I know!). Using the ladle, pour some batter into a frying pan. 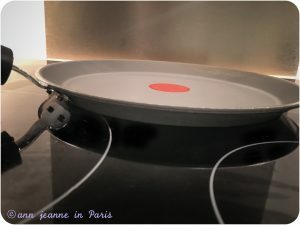 The batter is spread evenly over the cooking surface of the pan by tilting the pan. You really have to spread it thin. Cook until you see a tiny bit of crisping around the edges. The crêpe musn’t be golden brown. We usually eat them almost colourless. Slide the crêpe on a plate. And toss a very little powdered sugar on top. Cover crêpe with another plate. Then carry on cooking the other crêpes and put each crêpe on the top of the previous crêpes you’ve just cooked. When you’ve finished to cook all the crepes, eat them warm. You can also warm them up a little more a few seconds in the Microwave. You can also eat them cold later (very good too). Or you can choose to serve each crepe to your guests, or family before cooking the next one. Wh ich fillings for the crêpes ? Experience a meal in a crêperie, which means a place which specializes in galettes and crêpes. Don’t go to a place which is a restaurant serving crêpes and galettes and other meals too. However you can have nice crêpes (sweet) in some cafés. When at a crêperie ask for some cider with your galettes. It’s the traditional drink for this meal and they generally and traditionally serve it in a small bowl. Buying a crêpe or a galette to take away at a kiosk (stand) is a nice solution too. 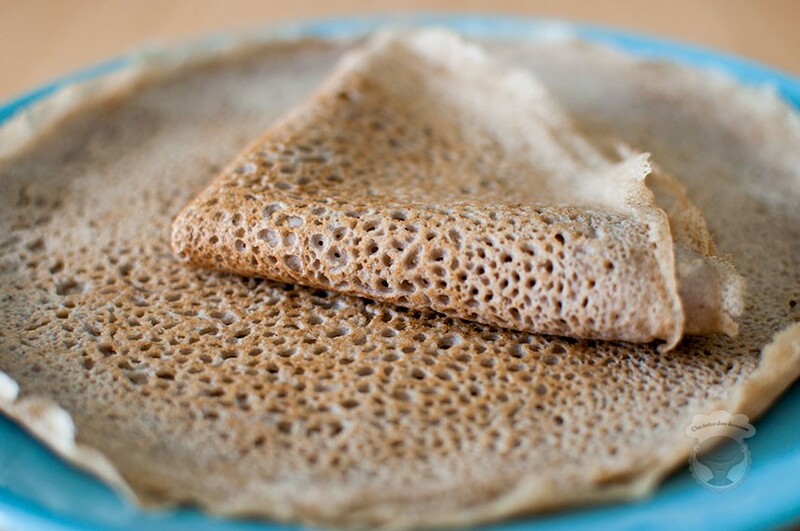 Don’t confuse crêpes with galettes : the galettes are savory and made from buckwheat flour. 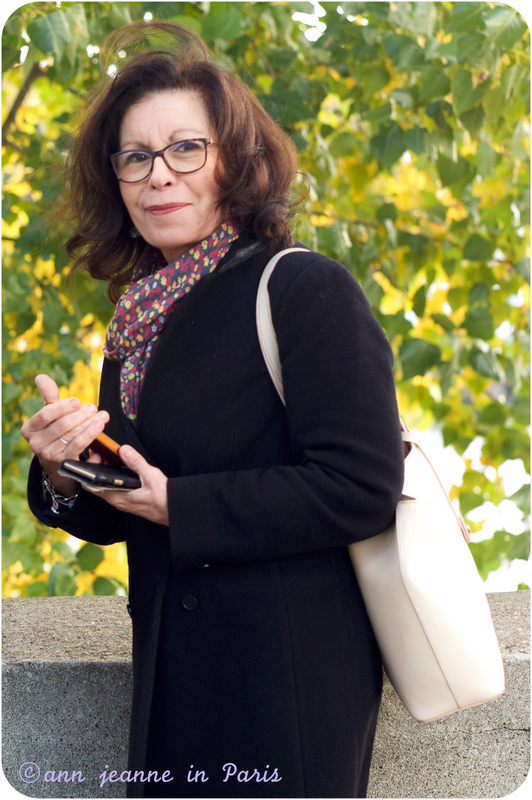 See Paris in another perspective and know more about Paris and Parisians FEEL WELCOME ! I’d be delighted to welcome you and share with you “my” Paris.